An accessory navicular bone is a common finding on many foot x-rays. Most accessory naviculars are asymptomatic. However, in some patients the prominent bone on the inside of foot will create discomfort, which leads to difficulty with shoe fitting. Alternatively, the fibrous union between the navicular bone and the “extra” accessory part may become irritated and cause discomfort. Diagnosis is completed through physical examination and plain x-rays of the foot. Treatment is usually non-operative, often including a change in shoe wear and activity modification. However, patients that have ongoing symptoms once non-surgical treatments are tried, often consider surgery to remove the prominent accessory navicular and, if necessary, reattach the posterior tibial tendon. 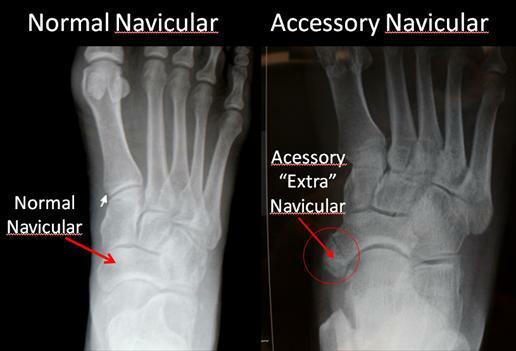 Many people have accessory (“extra”) naviculars (figure 1) – a prominent extra bone extending from the navicular bone. Most accessory naviculars are completely asymptomatic. However, some individuals will develop pain on the inside of their midfoot. Pain may occur from the pressure of the shoe ware against the prominence, irritating either the bone itself or the fibrous junction where the accessory bone meets the regular navicular. Alternatively, the fibrous junction or interface may become painful as a result of tension applied by the posterior tibial tendon through its connection or insertion at that site. Often, individuals will be asymptomatic for years, however, a new pair of shoes or a change in their activity level can cause symptoms. The accessory navicular itself typically develops during adolescence, when the two areas of the navicular bone fail to fuse together. Upon examining a foot with a symptomatic accessory navicular, there will often be a bony prominence on the inside of the foot, just below and in front of the inside ankle bone (medial malleolus). The size of this prominence will vary from small to quite large. Pressing over this area will often cause discomfort. There may be an associated flat foot deformity as this can occur in patients with an accessory navicular. Stressing the posterior tibial tendon by raising the heel up and down on one foot, or by forcing the foot to the inside against resistance, may aggravate the symptoms as these maneuvers stress the posterior tibial tendon which is attached on the inside of the accessory navicular bone. Patients may walk with a slight limp due to the pain. The Kidner procedure involves resecting the prominent accessory navicular and ensuring that the posterior tibial tendon is still attached to the bone. Often the prominent bone can simply be shelled out from its position relative to the posterior tibial tendon, which leaves the tendon intact. However, if the tendon is loose and floppy once the extra bone has been removed, suturing or tother is required as a means of attaching it into the remaining navicular bone. In most instances, a patient’s recovery will be as follows: 0-6 weeks: Immobilization (in case or cast boot) non-weight-bearing or touch weight-bearing 6-10 weeks: Increasing activity in a cast boot. Physical therapy to work on strength and balance Full recovery after 9 weeks-2 months In some patients (where the posterior tibial tendon is still intact and functioning) the treating surgeon may allow weight-bearing as tolerated in a cast boot immediately after surgery.